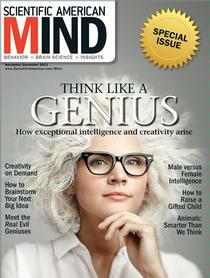 The latest issue of Scientific American Mind, which I read during a vacation last week (yes, I’m an exciting guy), takes on the subject of genius. “Genius” is one of those freighted words, something we consider exceedingly rare and overwhelming innate. But after reading SciAm’s package of articles, one of my takeaways is that genius in a less grandiose sense is as much about mindset as it is about ability or talent or gifts. Dan – I haven’t read this SciAm yet, but will do so. I like the thesis that genius is more about mindset than rare abilities / gifts. That said, even that mindset has to manifest itself somehow into an achievement or accomplishment, I would think. Those unique goals / targets that a genius mindset sees and aims for have to result in something. And, so, along the way, the genius individual has to cultivate some unique abilities / talents / gifts to accomplish those results. Just trying to think it through…. But, I will seek out this issue of SciAm to ponder further. Thanks. Michael Gelb’s work on the concept of genius is great. How to Think Like Leonardo Da Vinci, and Discovering your Inner Genius really puts a framework on what and who we consider great thinkers…. complexity made simple. The second one is BRILLIANT! Thanks for sharing. I’d have to say, Dan, that your observations are pure genius, because you facilitate innovational ideation and motivational strategies for us all! I love the line of thinking the article brings out because it leaves room for the diversity of geniuses to be found in multiple intelligences – word smart, art smart, movement smart, people smart, etc. That second quote blew me away! Wow is all I can say! Maybe I should go get a copy of this issue of Scientific American Mind? Thanks for highlighting this article for me. And when we are alive, we bring our whole selves and our uniques gifts and talents to bear on our work and in the world in powerful ways. WOW! Thanks for these quotes, Dan. I like that fact that the quotes speak to two aspects–seeing something new in your mind’s eye and being willing to make it real. I think genius emerges when you let go of trying to fit in. Brilliance does not conform. One of my role models is Ray Charles. He created his own style of music. Obviously, talent is involved. But what would have been the loss to the world if Ray Charles had not been willing to forge his own path? So, was Steve Jobs talented or a genius? ‘Talent is a myth’ Growth Mindset is the key. People just need to realise given the opportunity, high levels of motivation and effective practice they can achieve far far more than than they think possible.